It goes without saying that when people get older the vision gets weaker, emphasizing the importance of the accessibility of the living environment. For example, 20-something youngsters can detect facial features even in dim lighting, but when it comes to e.g. 40-year-olds, the same ability requires lighting more effective – to be more exact, the demand has at least doubled when turning 40. Not until recently lighting design and the standards used were strongly based on the vision qualities of the 20 to 30 year olds, but since the age distribution has changed and the need for the elderly care is increasing, the lighting solutions easing up the daily lives of the elderly are becoming more and more important. Proper lighting was one of the key elements when a new sheltered accommodation unit in Mänttä was being built. Winled was proud to design and deliver the lighting for the whole building. The nursing home consists of four group homes comprising of 15 apartments each. Each are inclusive of common spaces that support easy and accessible living of the elderly. Since all these spaces have different uses, the lighting has different requirements as well depending on the space being lit. For example, the common kitchen area has an effective lighting solution consisting of Eden LED panels, Spectri downlights and complementary LED strips. This entity was designed in a way that guarantees that the effectiveness is more than enough for tasks, such as cooking, requiring high definition. When it comes to other common spaces, such as hallways and toilets, the consistency of the lighting is more important than the effectiveness. When the spaces are shadowless, the accessibility improves notably and it is easier for the elderly to move from one room to another even during the night time. Also, Shadows and significant changes in the level of the lighting force the cornea to work harder, resulting in anxiety and discomfort. 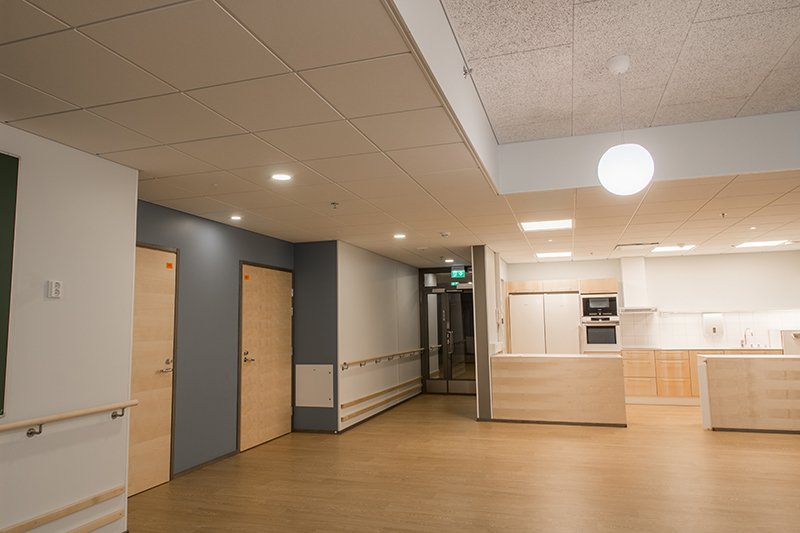 When the rooms in Mänttä nursing home were being designed, the goal was to create an even lighting solution minimizing the above-mentioned risks: therefore, the spaces such as hallways and toilets were mainly lit by Lilja-downlights that have an illumination angle of 120 degrees, this ensuring that the light is shed to an area wide enough. 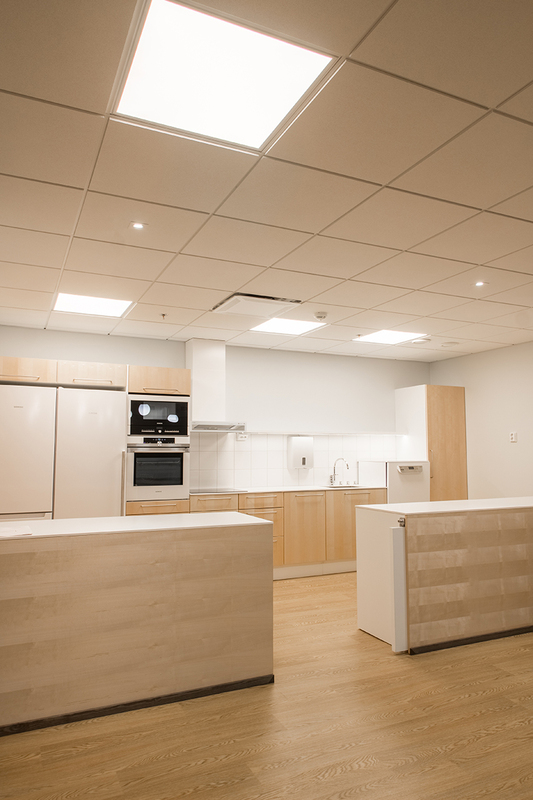 When designing lighting solutions for the elderly, it is important to build entities with little or no glare. 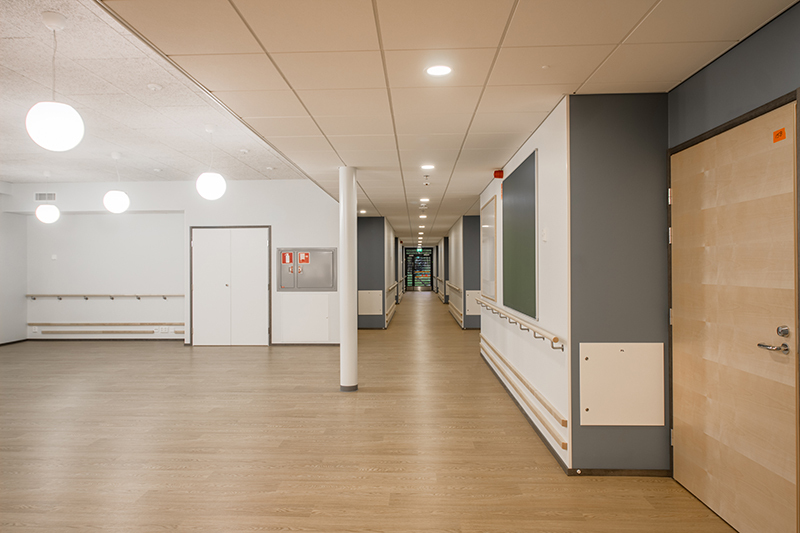 The luminaires chosen for the Mänttä nursing home have an effective glare shield, and in addition to this, e.g. 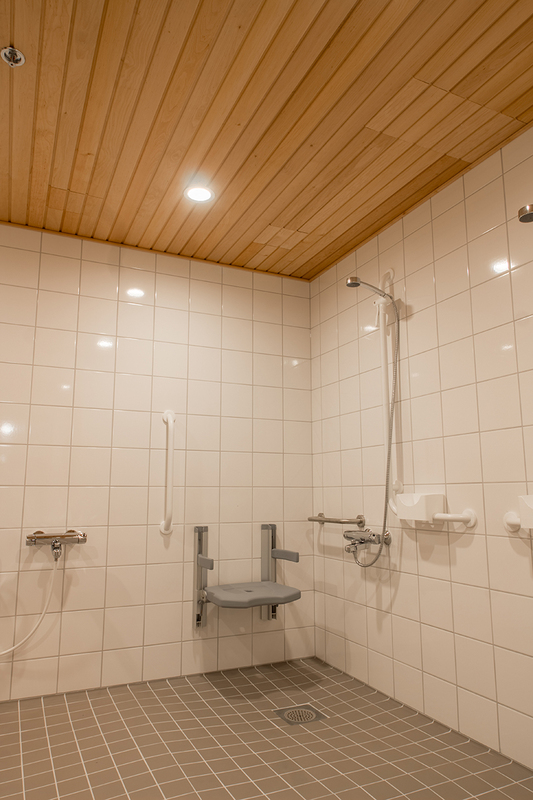 Iiris -downlights used in the common sauna- and bathroom areas have a light source that is located deeper than the frame of the luminaire, resulting in minimized glare. Motion detectors come in handy especially in nursing homes. They not only save energy but also provide great help when moving from one room to another in the dark – one does not need to look for the light switch since the luminaires turn on automatically whenever needed. 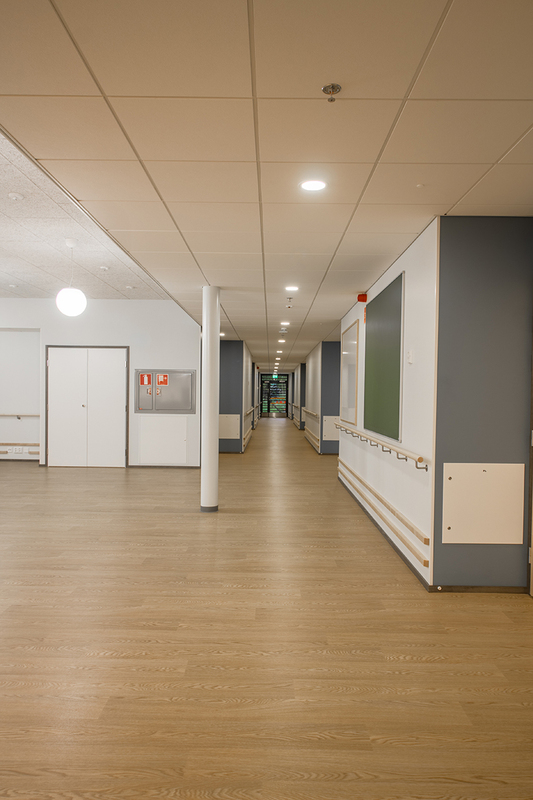 The personnel of the nursing home were not forgotten either when designing the lighting for the Mänttä nursing home. 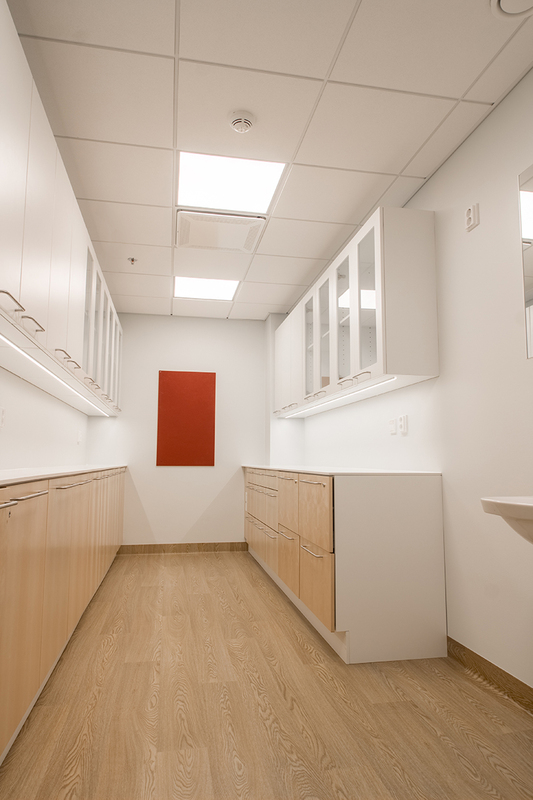 The lighting was designed to support the usage of every space – for example, the laundry room lighting was enhanced with the help of Eden LED panels, the utility room's working top usage was optimized with extra LED strips and the locker rooms were lit in a way that guarantees that even the furthest corner of the locker is illuminated properly. The daily lives of the elderly are being made easier in many ways, but still often enough the importance of proper lighting is being forgotten. For the level of the vitality, well-being and safety of the elderly to stay on a level high enough, it is good to acknowledge what a well-designed, effective lighting has to offer. Summa summarum, LED lighting not only brings prominent energy savings but also solutions that increase safety, amiability and user-friendliness.